I think it is safe to say everyone is watching the weather forecast, specifically the bone-chilling temperatures that are making their way towards Ohio. Temperatures are predicted to be below zero and falling into the double digits beginning this evening (01.29.2019) through Thursday (01.31.2019). 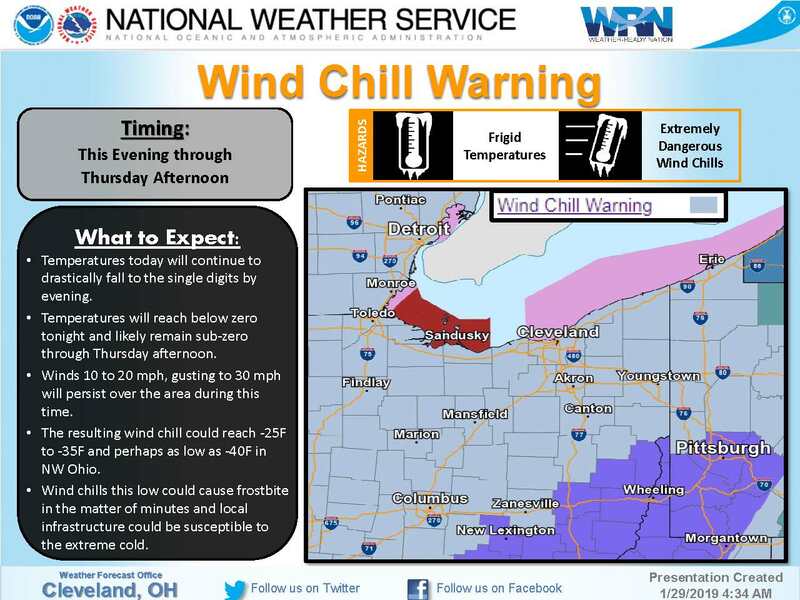 Wind chills are expected to be in the negative twenties, and could reach the negative forties depending upon location. The immediate concern of course is personal safety. Ashley Kulhanek, Extension Educator in Medina County shared an email update that she recently received. I have selected several slides to share in this BYGL Alert from that email message. If you have to be outdoors during the next few days, please be careful. In addition to the immediate impact the cold temperatures can have, there could also be some injury to plants that will not be evident until later. As temperatures warm and spring arrives, don't forget this chilling weather event - what could be record low temperatures in parts of Ohio - that may have some lingering affects. Stay tuned to BYGL more weather updates. We would love to hear from readers with their immediate weather observations, and plant observations later in the season.